Be Sure to Limit Yourself 4-0unces a Day! There is a big craze right now and it's kombucha. Advertising has really gotten people into drinking this drink regularly. Not only is it pricey, it may have some ill effects on your health. Many people are brewing their own kombucha and it poses a serious health risk when brewed incorrectly. I too jumped on the kombucha bandwagon, splurging on $4 to $6 bottles of the brew hoping to become healthy because of it. Unfortunately for me what I got was diarrhea and acid stomach. Maybe not everyone is experiencing the same ill effects that I did, but many are. This is a sobering reminder to be more discriminating when it comes to health claims that are not substantiated and fad health products that are flooding the market today. Kombucha is also called mushroom tea, it is a brewed black tea, sugar, live bacteria, and yeast. The SCOBY or Symbiotic Culture of Bacteria Yeast, is a wide variety of different bacteria and yeasts. The problem is some of the bacteria we can identify, some we cannot. It can be bought or if you have pals making kombucha they may give you some of their SCOBY. The homemade brewing process is pretty much the same, a sugary concoction of tea and SCOBY ferments for days, and sometimes weeks, in an environment that microorganisms thrive. The amount of time you ferment the kombucha and the equipment used is where things can get complicated. Many experts have advised against making kombucha at home. Microorganisms grow rapidly with moisture, sugar, fats, and protein. Temperatures between 40-140 degrees Fahrenheit, and pH levels between 4.5 and 10. Unfortunately, it is easy to contaminate than you would think. As your kombucha ferments, it becomes more acidic and it will create an inhospitable environment for many of the bad guys. Serious harm associated with kombucha has been reported. The CDC, Centers for Disease and Control and Prevention in 1995 linked kombucha consumption to two illnesses in Iowa. One of the two people who became ill died as a result. The CDC and the Food and Drug Administration did not find conclusive evidence that Kombucha was the cause, however, they did find that the surviving person had fermented their kombucha far longer than a usual week. They fermented it for 30 days, which made it much more acidic than normal. A condition that made it difficult for their bodies to adjust it's pH resulted. Based on these findings the following recommendations were made. Do not drink more than 4 ounces of kombucha per day and it is recommended not to ever ferment longer than 7-10 days if making your brew at home. Since that report was done in 1995 several other case studies involving regular consumption of kombucha have been linked to liver damage, metabolic acidosis, cutaneous anthrax, and lead poisoning. When preparing your own kombucha there is a small but significant danger. Certain conditions and being out of a controlled environment open you up to the risks. How Can You Brew Kombucha Safely at Home? When brewing at home take it seriously. Equipment needs to be clean and sanitary. Get your SCOBY from a trusted source, don't just use one of your friends. Know your facts and be able to inspect your SCOBY for black spots and signs of mold or contamination. Using soap or antibacterial products can kill your friendly bacteria. Use clean water containers that you can put in water that is over 160 degrees for 30 seconds. Always wash your hands often to be sure you are clean when handling your product. Use glass containers so you can heat them to 165 degrees when you brew your tea. Use glass containers to prevent acidic kombucha from leaching plastic and getting into the tea itself. Use plenty of sugar in your SCOBY, it will help to drop the pH level and cut down the chances of other bacteria growing during your fermentation process. People are also using other types of sweeteners like maple syrup, honey, agave, and molasses, but they are finding that it doesn't produce enough acetic acid-producing bacteria and they are getting less desirable results. Make sure you don't brew more than 7-10 days long. The longer you let it ferment, the more acidic and less sweet it will become. If you are one of those people who are sensitive to acidic foods it is likely you will be sensitive to this. Longer fermenting can increase the alcohol content from the usual 1% to 3%, which is significant. The FDA states that the only significant hazard, however, is the potential for acid-resistant pathogen growth during fermentation. To prevent this, the pH should be continuously monitored using a digital pH meter and recorded to ensure that the pH adequately reduces from about 5 to 4.2 within seven days. If the pH does not reach 4.2 within seven days after culturing, and then to an endpoint around 2.5, it is an indication of a contaminated culture or a lower than preferred fermentation temperature. The FDA states kombucha is safe for most individuals to consume up to four ounces per day. Possible health concerns are unknown for individuals with compromised immune function, pregnant or lactating women, young children, or those with preexisting conditions, and therefore consumption is not advised. Isolated cases of gastrointestinal toxicity resolved after discontinuation of kombucha consumption, and daily kombucha consumption over two months was a suspected cause of lactic acidosis among two women in 1995, but a definitive causal link was not determined in any of these reported cases. In 1995 a U.S. company started kombucha sales. It has grown steadily since. Public interest in probiotics and health benefits has driven growth and consumption of kombucha. According to Market Research Studies, kombucha grew by 29% from February 2013 to February 2014, yearly sales were at 122.7 million dollars. Between 2011 and 2012 kombucha sales reached an all-time high of 40% growth in sales. Today kombucha is the fastest-growing product in the functional beverage market and is projected to frow from a half-billion dollar industry to a 1.8 billion dollar industry buy 2020. Kombucha is consumed mainly for its supposed health benefits. Although kombucha has not been adequately researched. It was believed that it was a detoxifying agent, aid in gastrointestinal health and to energize you. These are all perceived benefits along with many others such as influence on immunity, weight loss, cardiovascular disease, atherosclerosis, hypertension, anemia, pulmonary disease, antioxidant qualities, and even cancer prevention. None of these are confirmed and all are under evaluation. So consumption of kombucha remains questionable for its health claim benefits. 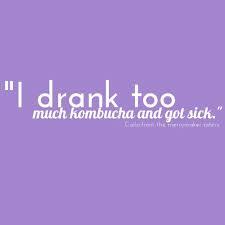 Many people have reported having a wide variety of negative symptoms from consuming kombucha. It has been known to cause stomach problems such as diarrhea, nausea, and vomiting. Other symptoms have been reported such as allergic reactions, jaundice, neck pain, head pain, and in some rare cases death. Some of the health claims such as curing cancer, for example, are so far from reality that it makes you question all the health claims that are being made. It is hard to imagine where these far-fetched claims are coming from, certainly not scientific research. No one is expecting an FDA approved evaluation but, certainly human clinical trial to suggest the possibility of these health claims. There are nearly 30 million medical citations in the PubMed database across the world, there is not a single human study for this so-called miracle drink. It is far time that the kombucha manufactures pay up for the analysis needed to support these health claims. Other smaller companies producing curcumin, with active ingredient turmeric had over 180 clinical trials. Rhodiola Rosea has over 40 clinical trials. Most of these food and drug manufacturers are paying for these studies on their own. They care about their consumers and want to back up their products with sound research to prove it's efficacy. So if kombucha is really good for you why don't these manufacturers pay for human studies to prove it.